When it comes to swimming, proper breathing is important. However, it can be problematic when you can’t breathe properly because of the water that enters your nose. This article will help you pick the best swimming nose clip in order for you to get an excellent swimming experience. 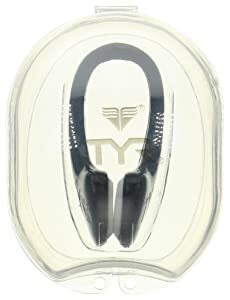 If you’re a casual or a serious swimmer, you’ll probably recognize some of these items as essentials: a swim fin, pool float, pool slide, swimming goggles, mp3 player for swimming, swim suit, and a swimming fitness tracker. What didn’t you see? Nose clips and nose plugs. It trains you to concentrate on breathing through your mouth (especially for freestyle stroke). It’s impossible to keep the water out of your nose when you’re doing butterfly strokes, back strokes, and other movements that require dolphin kicks and body undulations. It keeps chlorine and other pool chemicals out if your nose is allergic. 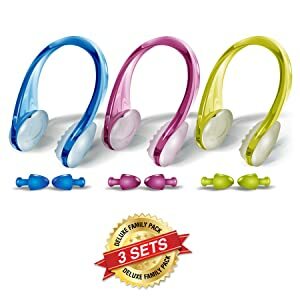 It is especially useful for beginner swimmers who haven’t mastered proper breathing techniques yet for particular swimming strokes and body undulations. Even if you manage to breathe properly for particular movements, you can never really avoid water entering your nose. That burning sensation will always be there. For people with sensitive noses, this can lead to catching a cold. Swimmers can now go beyond the usual yard or meter limit that they can reach without swallowing a gallon of water in the process. 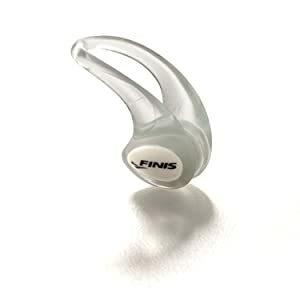 Not using nose clips can result to bouts of sinusitis. 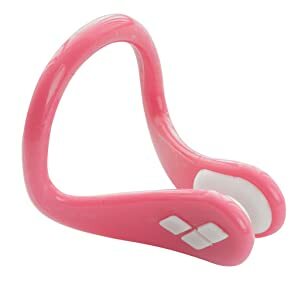 This particular nose clip comes with a bridge shaped like a U. It is made of stiff wire (some are malleable for adjustment) or nylon. It also comes with padded ends for comfort—these are usually silicone, latex or TYR. 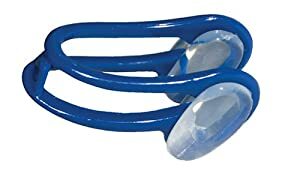 Some swimmers find it essential in nose clips to have an additional strap attached at both ends. 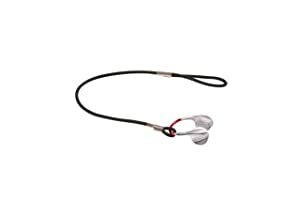 This strap helps keep them in place while the swimmer moves through the water. The added benefit of having a strap is that it’s less easy to lose, because it hangs from your neck rather than falls into the water when it slips off. Wear your swimming essentials first: swim cap and swim goggles. Simply push the nose clip against the nose. Make sure the bridge is facing upward. Push the ends against your nostrils to clamp them shut. If you’re using a strapped nose clip, put the nose clip on first. Wrap the strap around and behind your head. You can also put it behind your neck. Despite all its benefits, you might probably be thinking why you still haven’t really seen a lot of professional swimmers wear nose plugs and clips in competitions, or that some trainers still emphasize proper breathing technique instead of advertising nose plugs and clips. Just as there are pros and cons in everything for every person, nose clips and plugs do have negative effects. It may actually promote less efficient breathing, causing less physical efficiency in the water. It encourages “thoughtless breathing” instead of letting you breathe like a swimmer. Some swimmers stopped using them once they realized they could breathe better without it (they emphasize the important technique of blowing bubbles with your nose once underwater). Although it improves some sinus problems, some swimmers felt like it actually limited the amount of oxygen they were getting. A lot of nose clips are not that efficient in keeping the water out. If the seal is not good enough, it just traps water inside the nose instead of keeping it like it’s supposed to. It’s mostly great for beginners, but over time you won’t need one once you’re experienced enough. Most of them are very uncomfortable and break easily, so you’ll have to constantly keep buying them in bulks. Before purchasing nose clips, think about it first, preferably with your doctor (if you have any breathing problems). Consider how you can deal with the negative aspects of wearing nose clips and plugs. Once you’ve decided to buy one, here are a few recommendations for a swimming nose clip. 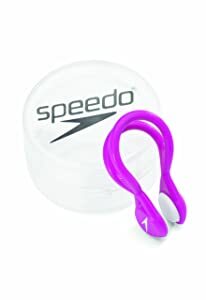 If you’re looking for the best nose clip for swimming, consider Speedo. Here are some pointers for you to consider about this particular nose clip. It’s easy to find in stores, as it is the world’s leading brand in swim gear. It has to be put on dry and without sunscreen. It may constantly slip—meaning it doesn’t have a good grip. It provides a tight fit. It has a durable stainless steel frame. It stays on even with sunscreen. The rubber retains oil from skin, so it will eventually start slipping off. It is comfortable and flexible to fit most noses. It has a durable plastic frame. It’s best for larger noses. 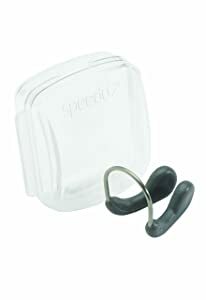 It’s made of allergy-free material 100% medical grade silicone). It works with nose rings. It doesn’t fit most noses. The earplugs work, but they are too small. It has a comfortable ergonomic design. It doesn’t go well with oily noses. The silicone pads may be too small for large noses. It’s best for beginners and kids (small noses). It has soft, comfortable pads. Its size is versatile to fit most noses. It can get too tight or can start slipping off. It has a cheap price. It’s not to be used with sunscreen. The plastic material breaks or melts. It’s comfortable and durable, for a period of time. The size is not appropriate for most noses. It stays on—if put on dry. It has a flexible anatomic bridge. It’s uncomfortable and can be a bit painful for large noses. You might not prefer nose clips. You may instead be on the search for the best nose plugs for swimming. Here’s one. It provides cushioned pads for comfort. It’s adjustable with its malleable wire frame. It’s not really that versatile to fit most noses. It is ideal for whitewater kayaking. It is designed by Eric Southwick, a former world champion in kayaking. It comes with a nylon cord when used as a nose plug for swimming. Make sure to check if it still stays oneven after a long swim. Test it out to see if it’s comfortable. 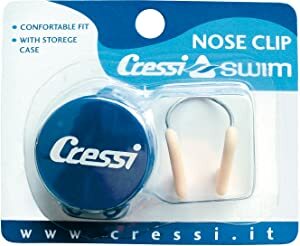 Also make sure to get nose clips thatare easy to find if they fall off your nose (either they float or come in bright and noticeable colors). Don’t fool yourself into thinking that nose clips with cheaper prices are always the best quality. Durability is important, so test them out a couple times to check if their durability is reasonable enough for their price. Choosing the proper nose clip can take time, so do consider buying them from a physical store near you. Put them on and see if they fit your nose size. Always go for flexible or adjustable ones.